In 1928, the year of the institution of the service, Royal Flying Doctor Service had access to a single base, and today is the service of medicine airborne more widespread throughout the world. Operates a fleet of 61 aircraft, 21 bases centers-including five primary care physicians, the service also supports every year more than 14,000 clinics scattered in the Australian community. The brand Oris at Baselworld 2013 will present the limited edition Royal Flying Doctor Service, which has developed in close cooperation with the agency. The pulsometer scale to help you read immediacy with the patient’s heartbeat is the figure on the dial in orange. The time adjustments are made through the crown at 4 o’clock position while on the 2, above which is inscribed with the shape of the Australian continent, it is possible to rotate the flange to read a second time zone. As is the case in Australia, you can draw zones of only 30 minutes. The case features a sapphire glass crystal with double anti-reflection coating for better readability and a transparent case back with mineral glass. Oris Royal Flying Doctor Service is delivered in one box with a credit card holder genuine leather, and a map with the local emergency numbers. 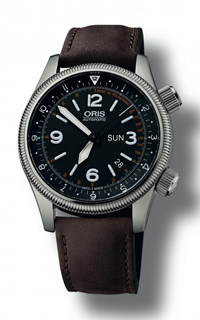 Water resistant to 10 meters bar/100 the limited edition Oris Royal Flying Doctor Service is an original timepiece inspired by the aesthetics of the Big Crown collection.